Underground sewer improvements along Michigan Avenue and Harrison Road will bring construction and lane closures this spring. Map illustrating the construction on Michigan Avenue and Harrison Road. 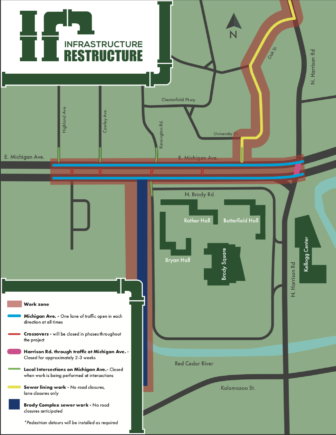 East Lansing’s infrastructure restructure project is meant to increase the sewage collection system’s capacity. It will also improve flow to the Red Cedar Interceptor and Water Resource Recovery Facility, according to a press release. The improvements will reduce the number of overflows with the combined sewer overflow basin. It will also separate storm flow, which does not need treatment, and send it directly to the Red Cedar River. There will be several phases to the project. Starting in March, construction will be at the Michigan and Harrison intersection, along Michigan Avenue from Harrison Road to Highland Avenue, on the west side of Brody Complex, and along University Drive and Oak Street. With the project approaching, preparations have begun. Approximately 30 trees in the median of Michigan Avenue will be removed before March 31. The timeframe on tree removal is due to the Indiana and Northern Long-Eared bats returning in April. Project authorities do not want the bats nesting in trees that will be removed. Trees will be replaced when the project is complete. During construction there will be closures, but at least one lane of traffic will be maintained in each direction throughout the project, according to the press release. The Michigan and Harrison intersection will be closed for several weeks in May. Most construction will be completed by December. Restoration of the site is set for spring 2020. There will be overview meetings at the East Lansing Hannah Community Center on March 13. A meeting for businesses will be at 4 p.m. and a citizens meeting is set for 6 p.m.
Genna Barner is a journalism student at Michigan State University. She has a passion for writing, designing, and photography. Genna is an intern reporter at The State News. She plans to graduate in Spring 2021 and hopes that in her future career she can design pages and report stories under one position for a publication.